Chitera Village, Malawi … Unless you are living the nightmare, it is impossible to imagine what it would be like to be “glued to your village” your entire life. It is a vivid expression and is the way Wilson Tembo described the situation he discovered when he met Charles Mpunzeni, a 47-year-old resident of this tiny village in Malawi. One of 12 children Charles was never able to go to school on his own, nor were his parents able to carry him to school. His mobility problems started with birth, and plagued him every minute of every day thereafter. In spite of having no education, no future, and no dreams of ever moving about the neighborhood Charles accepted his plight and set out, when he was old enough, to figure a way to gain employment and provide for himself. 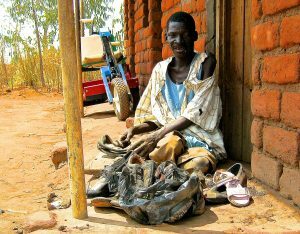 He was able to gain skills through a program of the Malawi Council for the Handicapped (MACOHA) and in 2000 he started mending shoes to create an income. “I used simple tools I made myself. MACOHA did not provide start up tools. But I made my own tools and have been using them ever since,” he said. He sat on the front stoop of his house and mended shoes for people in the village. He could do more business if only he could go to the trading center. Asked if he had ever had a means of transportation, he responded with a big “No”. “Many organizations promised help, but none came back to help me,” he said. Upon receiving a mobility unit, supplied through the Malawi Project and Mobility Ministries, he told Wilson this was the first time he had ever received anything that could help him get around. He had crawled on the ground all of his life. Just four days after his visit and delivery of the unit Tembo was visiting a nearby Trading Center where commerce took place and people came from villages throughout the area to buy and sell. What he saw there was somewhat remarkable. Entering the trading center Wilson discovered Charles had set up operations and was repairing shoes. Talking with him proved he is an extra-ordinary person. Unlike many of the physically challenged who spend their days in towns and cities begging for a hand out, Charles does things differently. He believes he can earn a living through hard work even while at his home village, and he also feels the responsibility of taking care of his family. He has a caring wife and four children. Using simple tools, Charles can make new shoes, belts, wallets and travelling bags. “I can make a range of products. The only challenge is that I do not have the required capital to buy raw materials such as animal skids, threads and equipment,” he said as he welcomed another customer who brought three pairs of old shoes to be repaired. According to Charles, $92.00 in capital infusion into his business can transform his family’s life and expand the business. “If I can have MK70,000 ($92.00) I can buy the needed supplies and start making new products that will fully support my family from the proceeds”. “I am extremely happy that someone has sent me this tricycle. I really appreciate it. I will cherish this gift forever,” he commented at the end.